ModianoCards.com is your only source for replacement cards in North America. If you value having the opportunity to replace your lost or damaged cards, be sure to buy your cards from ModianoCards.com or a participating reseller. Modiano Cards are an investment. We understand this and know that you will want to play with them for as long as possible. Modiano Cards bring an element of class into your game and you, your family and friends will appreciate the quality play that our plastic playing cards provide. 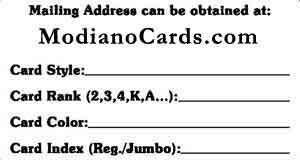 We want to ensure that you get all of the play you deserve from your Modiano cards. Therefore, as the leading distributor in the United States, we have decided to implement a replacement card program. 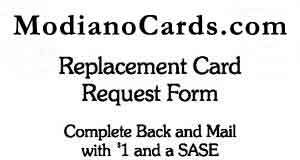 What is a replacement card program? This is a program that helps our customers and the customers of our resellers with a method to replace a damaged or lost card. A modiano deck is useless if it is not complete. You don't have to worry if you lose a card or damage a card. We are here to ensure you can continue playing with your Modiano cards for years to come. How Do I reguest a new card? If you purchased from a different website or seller, please contact them to see if they have a replacement card program or if they are a member of this replacement card program. If not, please include $3 and a Self Addressed Stamped Envelope with a printout of the replacement card form and mail to the above address. What if I didn't receive a replacement card request form with my website order? Simply print out this page and mail it following the instructions above.